After Sheila's (Alexis Fields) friend pulls out a gun at school, Roc (Charles S. Dutton) tries to keep the peace. This was an excellent show. It was like watching a play every week, as the cast members interacted perfectly with each other. It was free of the buffoonery and racial stereotypes that have permeated many other sitcoms with predominately African-American casts. In fact, the series premiered around the same time "Martin", another FOX sitcom did. Star Charles Dutton was very vocal about how it appeared that FOX promoted the buffoonery in the "Martin" show, while not giving enough attention to "Roc". "Roc" was one of few shows that focused on the lives of working class African-Americans. 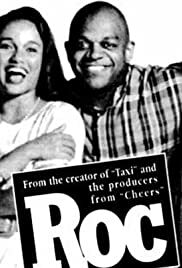 Just like the equally excellent "Frank's Place" on CBS, "Roc" received critical praise but disappeared way too soon due to low ratings. It is not shown in reruns often, but please catch the episodes when they are. This is a real gem.